Students wanting to build snowmen on Tuesday did not only wake up without school but without snow as well. As early as last week and as late as Monday, predictions from Atlanta’s National Weather Services anticipated up to one inch of snow in the city on Tuesday. But the city would not take any chance on winter weather — not after its infamous “Snowmaggedon” five years prior. Sleet and snow, combined with drivers heading home early, quickly deteriorated road conditions only a few hours into the 2014 winter storm warning. Commutes were gridlocked to the point of abandonment, children were stranded on a school bus and the city all but shut down for nearly a week. And this was all due to just two inches of snow. State and city leaders were heavily criticized for their handling of the storm, so their approach ever since has erred on the side of caution — especially since the city estimates that one million people will be coming to the city. Tech students and sports fans alike are aware of one of the biggest sporting events on television occurring at Mercedes Benz Stadium this weekend: the Super Bowl. While the nearest team in attendance has 1,000 miles between them and its home turf, Atlanta officials expect 150,000 guests from out of town. The city police and infrastructure teams are preparing by strategically closing roads with the overall goal of trying to control what they can. But it remains to be seen whether this will help anything, and so far, commute times have only been increasing as the week has progressed. On Monday, Governor Brian Kemp said state offices across the northern part of the state would be closed. 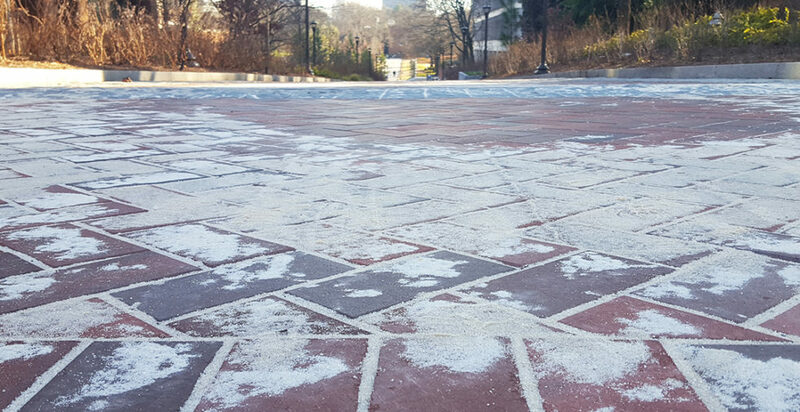 Atlanta Mayor Keisha Lance Bottoms directed the pretreatment of roads throughout the weekend until midnight Monday. Even Delta Air Lines, whose main hub resides at Hartsfield-Jackson Airport, proactively cancelled more than 100 flights on Tuesday out of fear for ice slickening streets and freeways. Tech administration followed suit while monitoring the storm. Starting Monday at 11 a.m., the university’s Office of Emergency Preparedness (OEP) kept an eye on models provided by the National Weather Service. It was not until the organization upgraded the Winter Storm Watch to a Winter Weather Advisory that Tech decided on the school’s closure for Tuesday. William Smith, director of the OEP, commented on the factors that went into the decision. But once the snow day came, the weather brought everything but snow. The skies quickly cleared and were cloudless for most of the day. Blue skies covered campus with warm sunshine providing some comfort to students walking in the cold weather. “While there are consequences in the form of lost instructional time, interruptions to business operations and research,” Smith noted, “we are primarily concerned with limiting the risk to our community,” Smith said. For a jam-packed spring semester that does not have much time off until spring break, students were happy to have a day to themselves.